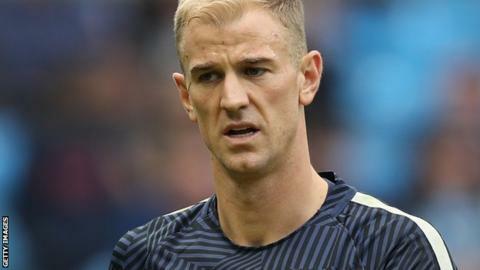 Manchester City goalkeeper Joe Hart is considering a move away from the club after being dropped for the first two games under Pep Guardiola. Everton and Spanish side Sevilla are interested in taking the England star. With just two weeks left of the transfer window, Hart, 29, is only interested in a loan move in order to examine his options. Barcelona's Marc-Andre ter Stegen and Claudio Bravo have been linked with moves to City. It is understood Guardiola and Hart, who knows he has no future at the club, have not built up any kind of relationship, with Guardiola saying on Friday that Hart does not have the time to become the kind of 'sweeper-keeper' he is looking for. "I am not saying he's not able to do it - with training he can do it," said Guardiola on Friday. "With time. But his time is now. It's not about what happens in six months, seven months." Guardiola opted to start with Argentine Willy Caballero against Sunderland and in City's 5-0 Champions League qualifier victory over Steaua Bucharest on Tuesday. Hart has made nearly 350 appearances for City in all competitions since joining them from Shrewsbury in 2006. He was England's most senior player at Euro 2016 behind Wayne Rooney with 63 caps, but he had a disappointing campaign with mistakes against Wales and Iceland as England were knocked out in the last 16.